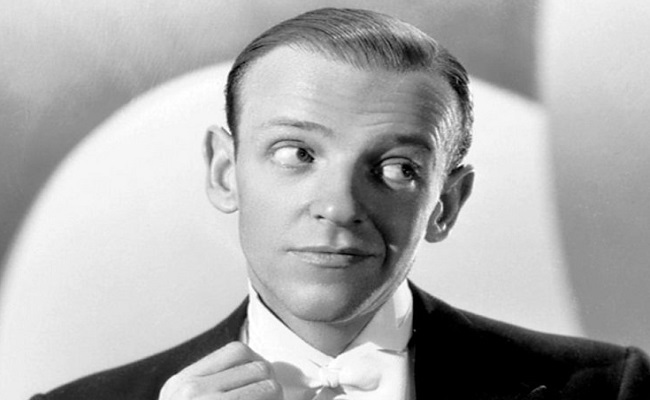 Born Frederick Austerlitz in Omaha, Nebraska, Astaire started dancing in vaudeville at age four, then teamed with his sister, Adele. He made a screen test for MGM in 1932, eliciting from studio head Louis B. Meyer the comment, “Can’t act, can’t sing. Balding. Can dance a little.” Despite this, he was cast in Dancing Lady (1933) then was teamed with Ginger Rogers in RKO’s Flying Down to Rio. The picture launched his cinematic dancing career, which extended into the late 1950s and featured a uniquely elegant tap style in which Astaire seemingly danced on air.